Whip the whipping cream, adding the vanilla sugar. Combine the jello powder with the boiling water and stir until the powder is dissolved. Add the 1/2 cup of cold water to chill it slightly. 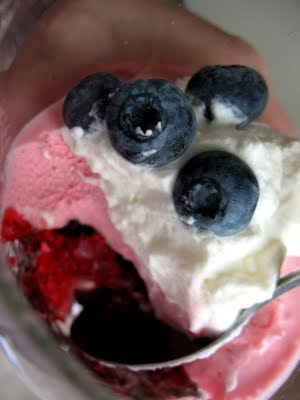 Divide the berries among 4 one cup wine glasses or parfait glasses. Pour 1/2 of the liquid jello over top of the berries, dividing the mixture among the four glasses. Whisk about 1/2 cup of whipped cream with the remaining jello liquid. Pour the cream mixture over the jello mixture, dividing among the four glasses. Chill. 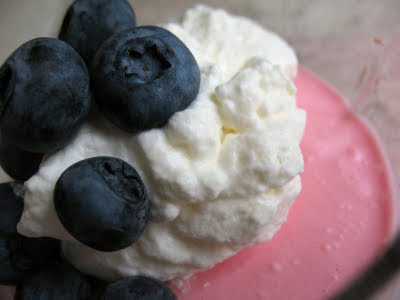 Top with remaining whipped cream and berries, shavings of white chocolate, or springs of mint. Best eaten the same day you make them. Note: To make vanilla sugar, put a vanilla bean in a mason jar and pour sugar over top up to the rim. Seal and put away for about a week.